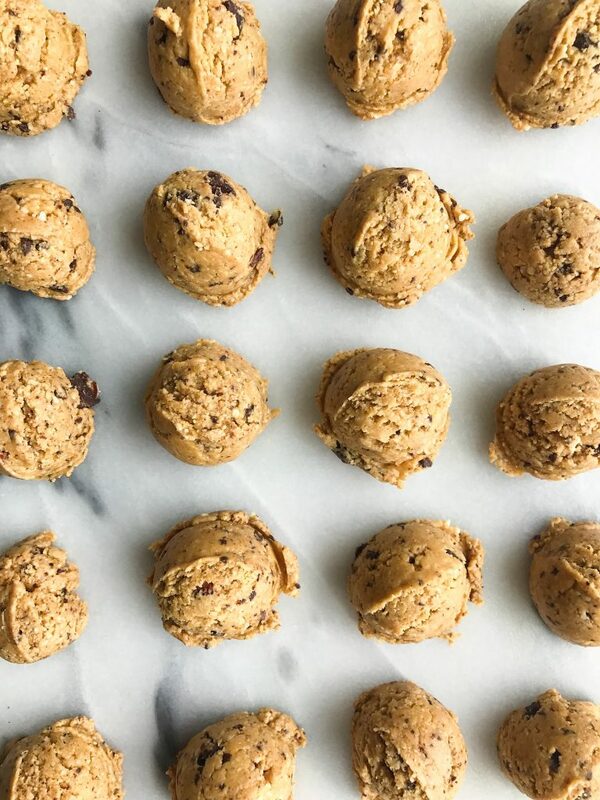 No-Bake Cacao Chip Peanut Butter Fudge Cookie Balls with no added sugar! When people ask me if I eat my desserts, I literally laugh. Like who would make desserts (especially simple and healthy ones) and not eat them? I have milk and cookies nearly every night after dinner and don’t plan on stopping anytime soon. I love my desserts, I live for them. That is why I even started making some! Going to organic bakeries weekly gets expensive way too quickly. I have however become much more aware of my sugar intake as I have really been trying to stabilize my blood sugar levels the past few weeks. I do think maple syrup, honey and coconut sugar are all OK to have but when I realized how much I was having everyday, it was overload. Coconut sugar and honey in my granola, honey in my snack bars, coconut sugar in my chocolate then some in cookies. Just a little much ya know? 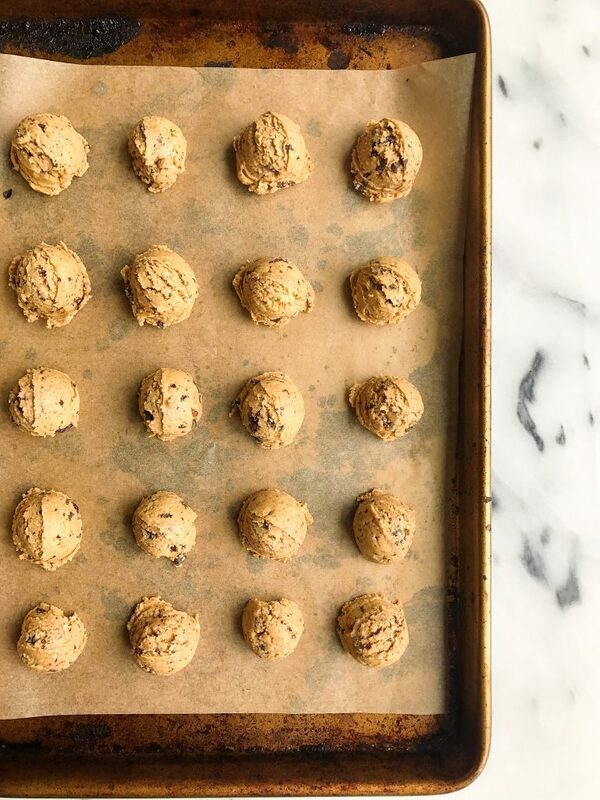 These No-Bake Cacao Chip Peanut Butter Fudge Cookie Balls are not only a mouth load to say but they are DREAMY. 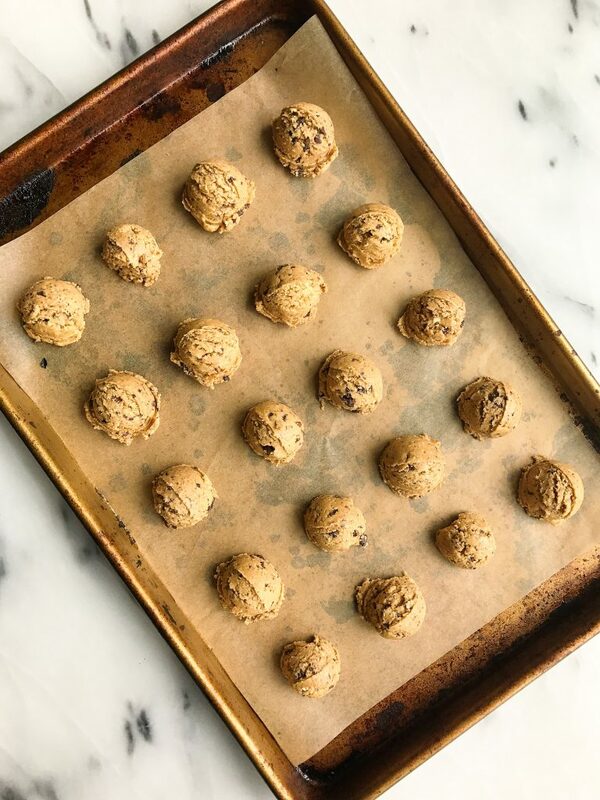 Think edible peanut butter cookie dough but no beans and no sugar. I didn’t add any maple syrup or anything! I used all natural peanut butter made from straight up peanuts and cacao nibs for the chocolate (but next time I am adding a crushed dark chocolate bar). They are SO good you guys are going to love! Pop in freezer for 30 minutes to set and enjoy! *You can store in fridge or freezer. Thaw out for a few minutes before eating if in freezer. Hiya! These look right up my alley, I love making my own desserts too and keeping an eye on the sugar. Real food makes me feel as though I have had enough sooner and I rarely eat the whole recipe in one sitting. I am curious… I don’t see any sweetness added to this recipe? You did it again! These look so DANG GOOD! Love the cashews in here- they really taste like cookie dough! Also, I’m digging’ how these don’t need to be baked. Easy recipes are perfect for me. Can you use a different nut butter?? These sound amazing! Cashews are my absolute favorite nut so These are perfect for me! oooo i need to try these!!! Yumm these look and sound so good! Anything with peanut butter and chocolate is hard to pass up. I’m trying to watch my sugar intake as well (easier said than done haha). Soo excited and love non-sugar recipes. Do the cashews need to be soaked before making this recipe? These look amazing, but I can’t have cashews! What could I use as a substitute? I just tried to make these but my blender got too hot & the chocolate melted 😂. It still tastes yummy!! To any readers that do not have cashews/have a cashew allergy/ or cashew preferences, I just made a CASHEW FREE version of these! I substituted chickpeas (just from the can, rinsed) with a 1:1 ratio to cashews. I did add a tiny splash of almond milk as well, but that may have been necessary because I also added chia seeds + crunchy peanut butter. Hope this helps any readers! This recipe didn’t work for me at all. I used my Vitamix and it kept jamming up because there wasn’t enough moisture. I used the brand Nutzo creamy peanut butter and can only think maybe the texture of this particular brand wasn’t a good fit for this recipe. I added a little more peanut butter and it still jammed. All I could think of to do at this point was to either add a little water or coconut oil – so I went with the coconut oil. It simply was difficult to pulse in the vitamix and I do know how to follow a recipe. The dough was difficult to get out of the blender and the blender difficult to clean. They don’t taste good to me at all and I hesitate to try them again. I promise I’m not a negative nelly………I just didn’t have success with this one. Bummer – I was so excited about these! IF I do try it again perhaps the food processor is the better way to go. I went with the vitamix out of convenience since it is already on my counter ready to go.. I will say that I didn’t want the high quality ingredients in this batter to go to waste – so I blended some of it with almond milk and a frozen banana and it was super delicious! I will be using the rest of it in smoothies! Yay!